With clean lines and a dark Black Onyx finish, this sofa has a refined contemporary look. 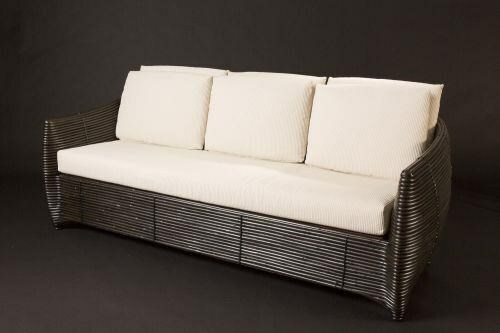 The wood, rattan pole, and rattan wicker frame has a distinct tropical vibe, balanced by the rich tone of the finish and the sophisticated contrast of the Sodari Beige fabric. The Valencia Sofa by C.S. Wo & Sons at C. S. Wo & Sons Hawaii in the Hawaii, Honolulu, Oahu, Hawaiian Islands, Waikiki, Diamond Head, East Honolulu area. Product availability may vary. Contact us for the most current availability on this product. Seat Cushion is made from fire retardant foam. Fabric: Sodari beige. Contemporary style meets tropical design with the effortlessly chic Valencia collection. Frames are made from wood, rattan poles, and rattan wicker for a distinct tropical look and feel. A Black Onyx finish creates rich tones and pairs with the neutral Sodari Beige fabric for a sophisticated contrast. Fire-retardant foam cushions promise a plush and comfortable seating experience. Bring a touch of the tropics to your home with the refined tropical style of the Valencia seating collection. The Valencia collection is a great option if you are looking for Tropical furniture in the Hawaii, Honolulu, Oahu, Hawaiian Islands, Waikiki, Diamond Head, East Honolulu area. Browse other items in the Valencia collection from C. S. Wo & Sons Hawaii in the Hawaii, Honolulu, Oahu, Hawaiian Islands, Waikiki, Diamond Head, East Honolulu area.